Doravirine/lamivudine/tenofovir shows non-inferior efficacy and safety compared with continuing therapy and is an option for maintaining viral suppression. This article is part of Infectious Disease Advisor‘s coverage of IDWeek 2018, taking place in San Francisco, CA. Our on-site staff will be reporting on the latest breaking research and clinical advances in infectious diseases. Check back regularly for highlights from IDWeek 2018. SAN FRANCISCO—A combination single tablet once-a-day regimen of doravirine/lamivudine/tenofovir disoproxil fumarate demonstrated non-inferiority and no significant adverse events when compared with continuation of established antiretroviral therapy in adults infected with HIV-1, according to results of the DRIVE-SHIFT trial presented at IDWeek 2018, held October 3 to 7, 2018, in San Francisco, California. 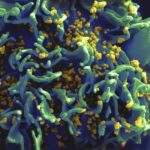 Two prior phase 3 trials have shown doravirine, a new non-nucleoside reverse transcriptase inhibitor, to be efficacious in the treatment of adults with HIV-1. Researchers conducted an open-label, active/controlled, non-inferiority trial in adults with and virologic suppression of HIV-1 infection to evaluate the efficacy of a single-pill combination of doravirine 100 mg, lamivudine 300 mg, and tenofovir disoproxil fumarate 300 mg vs continued established therapy. In addition, inclusion criteria were >6-month history of virologic suppression, HIV-1 viral load of <40 copies/mL, and no history of virologic failure or resistance to any of the aforementioned antiretroviral medications. Participants (n=670) were randomly assigned to start doravirine/lamivudine/tenofovir disoproxil on either day 1 (immediate switch group [ISG]; n=447) or after 24 weeks (delayed switch group [DSG]; n=223). The primary end point was the percentage of participants with HIV-1 viral load <50 copies/mL, the primary comparison between the ISG at 48 weeks, and DSG at 24 weeks. At 24 weeks, 93.7% of individuals in the ISG and 94.6% of those in the DSG demonstrated a viral load of <50 copies/mL. Of note, 1.8% of each group had >50 viral copies/mL. At 48 weeks, 90.8% of the ISG, vs 94.6% of the DSG at 24 weeks maintained viral load of <50 copies/mL, demonstrating a difference of -3.8% (95% CI, -7.9% to .3%). A secondary outcome was that at 24 weeks, individuals in the ISG had significantly lower fasting low-density lipoprotein cholesterol and non-high-density lipoprotein cholesterol levels compared to individuals in the DSG (P<.0001). In addition, adverse events at 24 weeks were higher in the ISG vs the DSG, and most were mild in severity. Does Stroke Mechanism in HIV Vary According to Preceding CD4 Counts? Visit Infectious Disease Advisor‘s conference section for continuous coverage live from IDWeek 2018. Kumar P, Johnson M, Molina JM, et al. Switch to doravirine/lamivudine/tenofovir disoproxil fumarate (DOR/3TC/TDF) maintains virologic suppression through 48 weeks: results of the DRIVE-SHIFT trial. Poster presented at: IDWeek 2018; October 3-7, 2018; San Francisco, CA. Poster LB2.